CloudWay is very proud that MVP Jan Ketil Skanke was chosen to fill one of the speaker slots for IT/Devconnections in San Francisco. Jan Ketil is delivering 2 sessions at this event in October. One of the buzzwords of today is identity driven security. What is it really? Come and learn how to use Conditional Access together with other Microsoft protection solutions in the cloud to protect your applications and data both Onprem and in the Cloud. We will deep dive into how this comes together with Microsoft Intune and Azure AD Identity Protection. Learn how to take back control of your Android devices in the enterprise by using Microsoft Intune standalone or System Center Configuration Manager integrated with Microsoft Intune. IT/Dev Connections 2017 is considered the “Anti-Keynote” conference – which essentially means we don’t force attendees to manually sift through fluff or marketing content, nor do we base the event on vendor messaging. 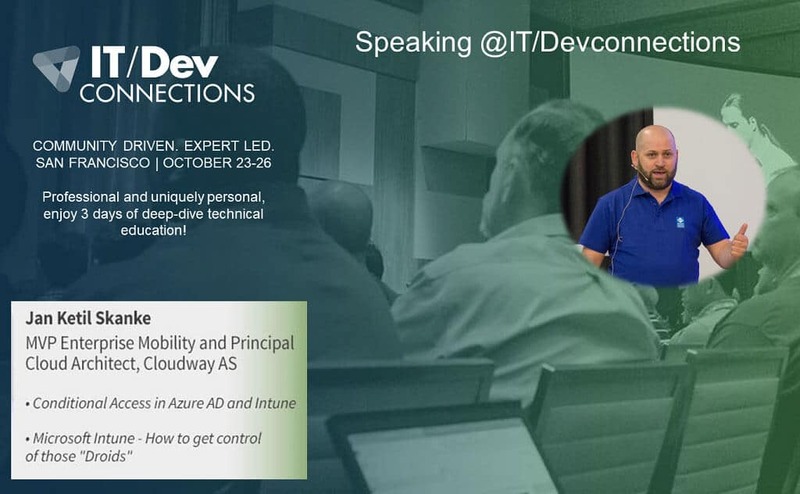 IT/Dev Connections offers the most intense training opportunity available – more than you’ll get at any vendor-sponsored conference. So skip the marketing and get to the meat!